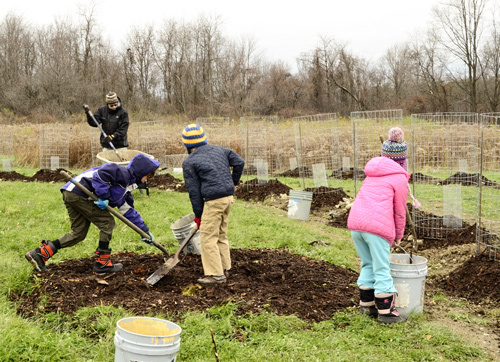 On a frigid November morning, 31 adults and 9 children joined together on EcoVillage land to plant 51 chestnut trees, provide them with protection from hungry critters, and mulch the trees for winter. Akiva Silver of Twisted Tree Farm was our guide. The work was complete in less than an hour – a superb illustration of the power of the community working together! Months earlier, the Land Partnership Committee had begun planning and preparation for this day. The land was marked and plowed on the contour, disked, and a cover crop planted to add more organic matter to the clay soil. Before planting, the soil was piled to form berms/mounds in which to plant, with a swale/gully along the side for drainage. Akiva assured us that November was ideal for planting. The trees were dormant. For the children he added, “The trees are sleeping. They won’t know they’ve been moved until they wake up in the spring.” The bareroot trees were in buckets of water, and we were told to try to take no more than a minute from the time we removed one from the water until it was planted into one of the mounds. 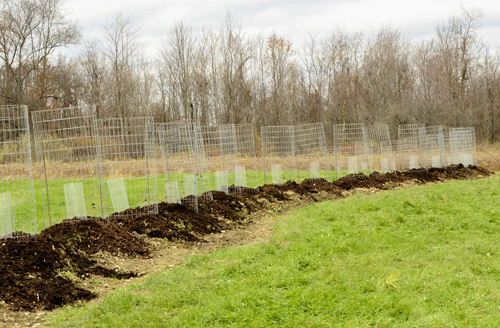 After planting a tree, the mound was mulched, and wire cages were placed around for protection. Akiva shared that the chestnut used to be the dominant tree species in the forests of the eastern US. It is an amazing tree. Its timber is straight-grained, light, easy-to-work, and strong. Its wildlife values are very high because it reliably produces nuts every year. It grows large like an oak and is long-lived. Its nut is bigger than an acorn and tastes better. In fact, the chestnut could be a key ingredient of a sustainable food supply. The chestnut has a nutritional value similar to brown rice, and tastes better. Akiva described the Chestnut as a “manna” tree that keeps growing, dropping “grain” each fall. The nuts can be roasted, dried and added to soups and stews, and ground into a gluten-free flour. It has a tremendous yield per acre without depleting or destroying the ecosystem. This “grain” grows in an ecosystem with other plants and animals, and it can grow anywhere, not just in fertile bottomland. Trees like the chestnut can replace staple, annual grain crops. 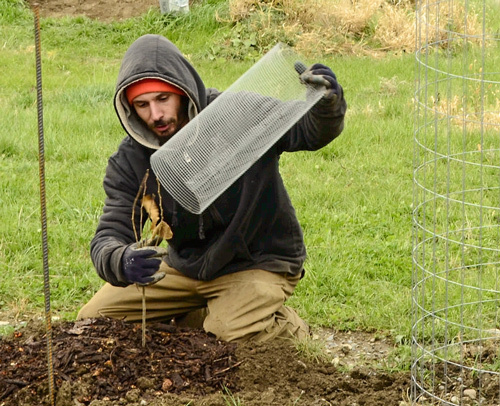 Our trees are blight-resistant hybrids, grown from seeds collected in a local chestnut orchard. Nut trees are wind pollinated, so we planted densely for earlier pollination. In our new orchard, we are breeding. Because our trees are seedling-grown trees, they are more variable. In 10-15 years, we should have an alley of chestnut trees. Each one will be different. We will look for “best genetics” and will begin to select for the ones that have the best tasting and most prolific nut production. Others will be cut down, but they will resprout from the roots, producing strong wood for such things as fence posts. The hope of Akiva and many others in our region is that in the not-too-distant future, Ithaca will have a nut processing facility where we can all bring our nuts to be transformed into flour, nut butters, and such. 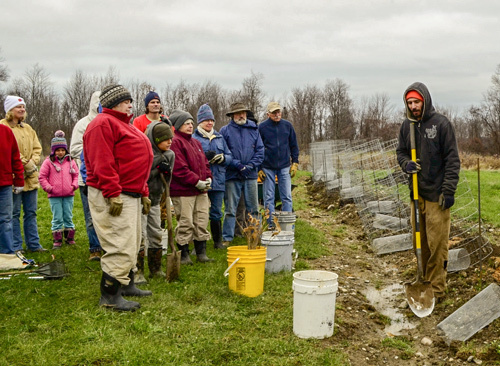 This orchard adds EcoVillage to the many growers who are striving to bring the chestnut back to North America as part of a sustainable food system. To see more of Frank’s photos of the planting, click here.